While thousands of new products and technologies will be shown off at the annual Consumer Electronics Show 2013 getting under way this week, I take a look back at the future technological wonders we dreamed about for the post war years. 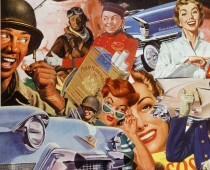 As a forward-looking people Americans have fervently welcomed technology and invention into every aspect of our lives. 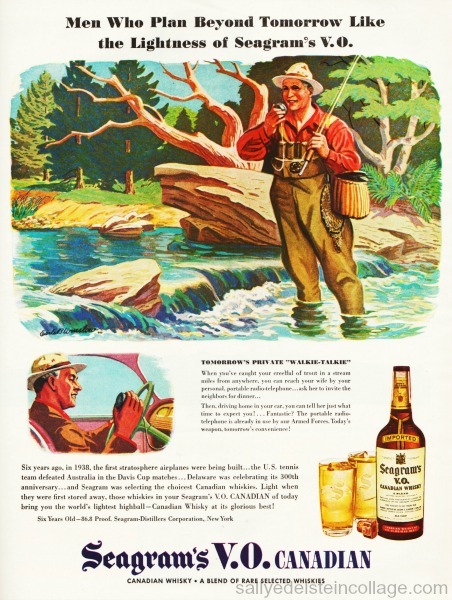 To learn about the future of the past, I take a look at a series of ads run by Seagram’s Canadian Whiskey entitled Men Who Plan Beyond Tomorrow. that ran during the early post-war years. Long before Apple’s smart thermostat The Nest, the futuristic home heating and cooling device that anticipates your temperature needs, the men of tomorrow envisioned automatic sleep comfort in your own home. The American in the post-war, was going to live in a house built of glass, plastic and maybe a slab or two of steel or aluminum which was bought in a department store, delivered in a van and erected in a few hours. It was radiant heated, this house; it stayed warm in subzero winter with the windows wide open, and in the summer, by a switch of a button it would be cooled with equal effectiveness. It was a fluorescent lighted domicile that was sound proof, dust-proof, termite proof. And germ proofed ( by ultraviolet lamps). “This 120 passenger car, lighted by cold cathode, will be air-conditioned and cleansed of dust, smoke and odors by static electricity. In a world before Skype and computers, the work world envisioned by the copywriters in this 1945 advertisement came pretty close. The man of the house was to commute to his office in a modest helicopter that any fool could fly and that cost him no more than what he paid for his pre-war medium priced car. But if he had to drive his car into town, it really wasn’t such a bad deal. It was a featherweight job made of plastic and light metals, with a transparent plastic nose and a plastic sky view top that admitted the health giving ultraviolet rays, shut out the bothersome infrared rays and thus permitted passengers to take on a rich coat of tan without the discomfort of sunburn. In 1946 who would have imagined a world of bluetooths, smart phones, fax’s, and e-mail? The Men of Tomorrow did…sort of. Motorola had provided the army with Walkie Talkies so it was a natural assumption that they would catch on with the post war civilian. It would be several decades before the ubiquitous cell phone entered our daily lives. Now texting, tweets await the men who planned beyond tomorrow. And now in the comfort of our faux leather booth while dining at Applebees we never have to miss an episode of Duck Dynasty! The Men who planned beyond tomorrow obviously weren’t locavores nor concerned about their carbon footprint.